Models are very helpful to a variety of professionals. Auto manufacturers use models to designs cars that are more aerodynamic. Architects build models before they construct high-rise buildings so they can better imagine the finished structure. 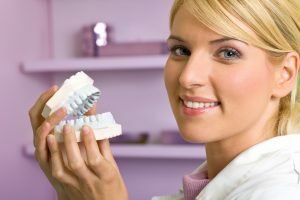 And dentists use models in order to visualize possible changes to the shape and alignment of your teeth or the smile that will result once a crown and bridge of denture is in place. Dr. Scott, your dentist in West Monroe, frequently uses wax-up models in order to designs better-looking smiles for his patients. Dr. Scott uses a diagnostic wax-up to not only help him visualize the outcome he wants to achieve for your new smile, but also to let you see what’s happening, as well. You’ll be able to see what the dentist’s proposed solutions will look like on the wax model, so you can make a more informed decision about your dental work. If you or Dr. Scott thinks adjustments are required, then the model can be adapted to reflect changes before our dental lab begins working on your new oral prosthetic. Wax-ups provide a realistic projection of how your dental work will look and function, which results in accurate restorations. Dr. Scott often fabricates a wax-up model of jaws and teeth when working on more complex restorative or cosmetic cases. With porcelain veneers, for example, a wax-up model ensures that your new smile will look natural and fit comfortably in your mouth. Likewise, a model is vitally important to the fit and comfort of dentures. There are basically four types of diagnostic wax-ups used in dentistry. The basic diagnostic wax-up. This type of wax-up is used to develop an overall game plan for the restorative procedures. This is an excellent aid for visualization. The full-contour wax-up. If improved esthetics and contours are part of the treatment plan, then a full-contour wax-up is best. It offers the same visualization benefits as the basic wax-up but with more wax it is often preferable when missing teeth are being replaced with dental implants or another type of prosthetic. Case presentation wax-up. This detailed wax-up shows a patient the end result of a personalized treatment plan. A pink baseplate wax may be used to replicate gum tissue for a more realistic model. Orthodontic wax-up. Orthodontists and dentists providing braces use this wax-up to show the possibilities when repositioning teeth. Wax-ups can be a helpful tool for Dr. Scott to use when you need restorative or cosmetic dental care. To learn more or to schedule an appointment, call our office today.